Fans looking for discount tickets to see the rock music legend Paul McCartney are now in luck. Epic Nation Tickets has released a promo code for fans to use on all upcoming Paul McCartney concert tickets. Epic Nation Tickets is offering a great opportunity for fans to purchase cheap Paul McCartney tickets for all remaining shows. There are only a few more opportunities to see Paul McCartney live in concert as the number of tour stops dwindles down to only 10. For those fans wanting to check out this once in a lifetime show, the “Out There” tour by Paul McCartney has been just that. With only ten shows remaining on the tour, Epic Nation Tickets is offering a great opportunity for fans to purchase cheap Paul McCartney tickets for all remaining shows. For a limited time, Paul McCartney fans can use the promo code “OutThere” to receive 5% off all orders for remaining shows. The reviews are coming on the past Paul McCartney shows and it appears those fans planning on seeing McCartney in one of these upcoming ten shows are in for a treat. After his most recent concert at the Barclays Center in Brooklyn, New York, an editor from Rolling Stone magazine wrote the following: “It's nearly impossible to feel anything but excitement watching McCartney play many of the greatest rock songs ever written, and he's careful to bring more than a few surprises each time he comes around.“ Many fans were said to be tired from singing all night long with the legendary rock n roll legend, but Paul McCartney didn’t seem to break a sweat. Paul McCartney tickets are hard to come by for many of his upcoming shows. Fans who purchase these premium tickets will hear classics from The Beatles, Wings, as well as many of McCartney’s solo acts as well. The promo code “OutThere” is only available for upcoming Paul McCartney concerts in Washington DC, Boston, Indianapolis, Milwaukee, Seattle, San Francisco and more. These tickets are sure to sell out, so fans are encouraged to take advantage of this discount code quickly. 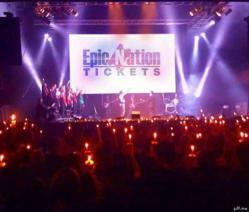 Epic Nation Tickets is the number one source for tickets to all sports, concerts, Broadway shows and Las Vegas acts. All transactions are 125% guaranteed. Fans that are looking for premium Paul McCartney tickets are also probably interested in affordable Eagles tickets as well, which Epic Nation Tickets has a large supply of.